**Be Advised: We will NOT open all of these shelters during any single event. The opening of shelters is dependent upon the nature of each specific event. • Leaving early – head to Central Florida. • Leaving early – head to Southeast Florida. 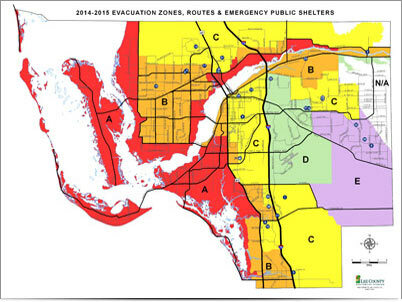 • Once an Evacuation is Ordered – head to Southeast Florida, or stay in county, away from the Coast. • Stay in Lee County, away from the Coast. What Does This Map Mean To You? The bold squiggly lines are main roads in Lee County, also designated as Evacuation Routes. We use these roads to create familiar boundaries on the map, and overlay the Storm Surge Map, forcing it to fit these boundaries. Dividing the map in this way allows us to create a built-in safety margin for each Surge Evacuation Zone. Population and Evacuation Clearance Times influence the configuration of Surge Evacuation Zones. The biggest misconception about the Storm Surge Map is regarding Zone N/C. This Zone is without a defined risk, because it is where the Storm Surge computer model ends. This will be corrected in future updates by the National Hurricane Center. Do not make the mistake of thinking it is the safest area of Lee County. Every part of Lee County is at risk from Storm Surge. Evacuation Clearance Time is defined as the time necessary to safely evacuate people from the point when the evacuation order is given until the last evacuee can either leave the evacuation zone, or arrive at safe shelter with the county. What does this mean for you? You need to evacuate early, and absolutely no later than when the evacuation order is given. Moving people in Lee County takes quite some time, up to 41-hours, and that time only increases once you leave the county. It can take up to 89-hours to evacuate out of Southwest Florida simply because of the infrastructure.